When my husband and I were living overseas, we did our best to celebrate the holidays by surrounding ourselves with friends and hold on to as many of the traditions we grew up with. It was, however, quite difficult to replicate Christmas without snow or readily available Christmas treats like candy canes and boxed chocolates. There was no early eggnog gracing the shelves in November, no gingerbread houses to be decorated, no trees strapped to the roofs of cars, or a schwack of holiday parties to keep you busy. No. Turkey and eggnog was only to be found after an hour-long plus trek to a Costco (and back! ), candy canes and gingerbread kits were sent from Canada, and holiday parties consisted of school plays and potlucks with lots of KFC. So, one year, we decided to throw a real Canadian Christmas for all of our friends. It took 12 hours to roast the smallest turkey I could find in my toaster oven (the largest available). We made two bigs pans of stuffing, enough mashed potatoes and gravy to serve an army, and a big salad. Did I mention I only had burners? Roasted veggies was just not an option. Rum and eggnog, a first for friend from Australia, flowed freely. Cheese and wine graced our bellies all night. And my friends finished their made-with-care-and-holiday-spirit dinner with my Grandmother's shortbread. I called my mom and asked her if she would refresh my memory and share the family recipe with me again. She responded by not dictating the recipe, or sending an email. Rather, she sat down at her table, and wrote in her perfectly beautiful cursive the recipe that my grandmother used when making our Christmas cookies. And then she tucked it in a box with a special surprise and shipped it all the way to Taiwan. I opened that box weeks later, nervous that I had not received a cookie recipe for our party, and found not only my mother's note, but two of the cookie cutters my mother and I used year after year to make our family shortbread. A bell and Rudolph. I had been looking for traditions everywhere and there, in a small box, all the way from Canada, I stared at a treasure. I made my grandmother's shortbread for my friends and they smiled with every, melty bite they enjoyed. 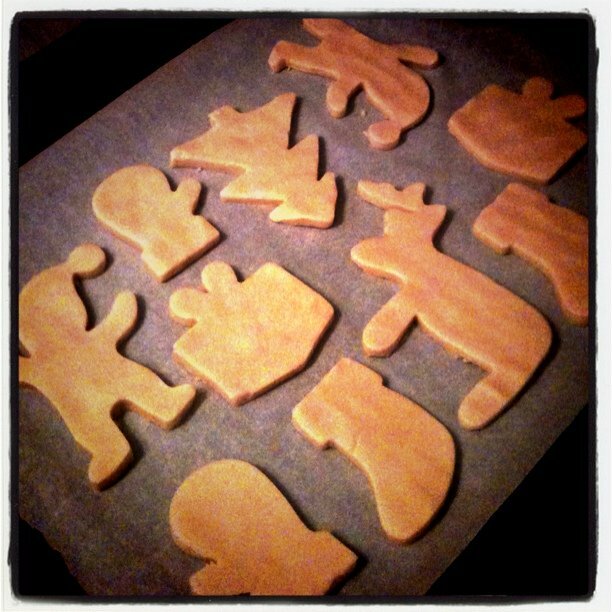 This year, as we're back home in Canada, I made them again; but with different cutters, as I begin to build my own traditions. During this holiday season, may you keep old traditions and form new. And may you be surrounded with loved ones and lots of shortbread. That's so sweet Maria! We need to build a tradition together; any suggestions?